The story tells of the heart-wrenching saga of the Romanovs, a family from Russia who traveled the world in search of a cure for their daughter Ksenia’s cancer. Ultimately, a cure was not found, but the promise of a better life for their remaining children brought the family back to New York City with hope for US citizenship and their own American Dream. This story is an example of how Marks JCH is leveraging skills and expertise gained as a result of resettling more than 50,000 Jews from the former Soviet Union over the past 25+ years to help anyone in need, regardless of status. As we say often at Marks JCH, it doesn’t matter who you are or where you’re from, the J is here to help. 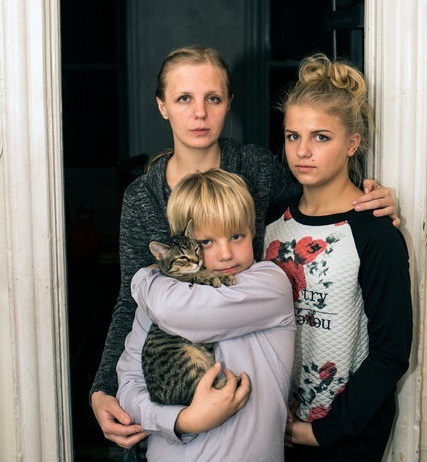 In March 2016, a more than a year after Elena brought her two surviving children back to New York, first for medical treatment for her eldest, Anna, and remained in New York with the hope of gaining political asylum as a religious minority in her native Russia, she began searching online and through word of mouth, for a recommendation for a summer camp for Anna and younger brother, Artem. Through google and word of mouth, Elena brought the kids to Marks JCH to apply for a scholarship for Artem to attend camp and for Anna to access teen employment opportunities. Artem had a great summer in Marks JCH’s Compass summer program sponsored by NYC Department for Youth and Community Development, but his summer was not without difficulties as a result of the family’s ongoing grief at the loss of Ksenia, and their many moves around the world and within New York. Working closely with Lily, our mental health consultant, our camp staff helped Artem and his mom to address his grief and adjustment issues, and achieved success in enabling Artem to complete the entire camp program. Following the summer, the family has been engaged in Marks JCH family programs, meeting regularly with other single parent families and with our caseworker. As is mentioned in the article, Elena found herself in the situation of becoming a single parent after her marriage disintegrated following Ksenia’s death. Through the Marks JCH team’s ongoing work with Elena, we were able to identify her need for emergency cash assistance last month. She was referred to our job placement department, which is providing help with resume writing and finding a better job, to allow her to continue to support her kids while attempting to advance her own career options. The agency is working with the family to help Anna improve her English with the goal of enrolling Anna in our Summer Youth Employment Program next summer. The family has been referred to local food pantries for concrete help with food until such time that they may qualify for food stamps and other benefits available to asylees. The Romanov family’s story is yet another example of the trauma brought on by loss of a family member and by immigration. That Ksenia died so young has compounded the trauma, as has the fact that the family were practicing Baptists, not a well-known nor protected religion in Russia. It is an honor and privilege for Marks JCH to continue helping Elena, Anna, and Artem through the agency’s unique 360 degree service model.